The maritime regions of Québec are dotted with small inns and B&Bs providing comfortable rooms and a restful atmosphere. The ones I mention in this post all offer a maximum of a dozen rooms, but the comparison ends there as each is otherwise completely unique. 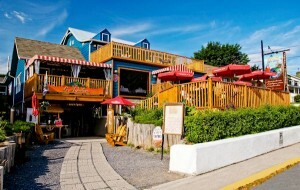 Located on a cape, Auberge de l’Anse is a rustic seaside inn only a few minutes away from downtown Rivière-du-Loup. 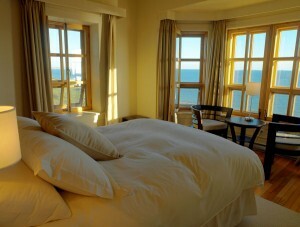 All the rooms offer a view of the St. Lawrence and spectacular sunsets. Breakfasts and dinners featuring regional cuisine are served in the dining room or on the terrace. If you are heading inland, I recommend you spend the night in one of two inns in Témiscouata-sur-le-Lac. The first, Auberge du Chemin Faisant, is renowned for its unique rooms and excellent restaurant, which combines local cuisine with gastronomy in a friendly and relaxed atmosphere. Each dish is a work of art, to be savoured by the eyes as well as the palate. In the evening, if you’re lucky, you can listen to Hugues Massey, the chef innkeeper, play the piano while you eat. Your other option is the Château Fraser Hotel, which welcomes you in an elegant decor. Spacious and comfortable rooms, luxurious furnishings and sunny balconies—every detail has been considered for your enjoyment. You have your choice of rooms, including the sensual Versailles or the Romantic with its double therapeutic bath. Some even have a fireplace. This is your opportunity to enjoy modern chateau living! At the other end of the region, in Saint-Gabriel-de-Rimouski, Domaine Valga is a little corner of paradise in the forest. This log inn, the largest in Eastern Québec, offers 6 rooms, some of which have a view of the lake. Enjoy meeting fellow guests in the lounge and savour homemade food made with love by innkeepers Chantal and Éric in the dining room. Causapscal, in the Matapédia Valley, is a great place to stay if you enjoy the cosy atmosphere of former homes. Located on a small hill set back from the road, Auberge La Coulée Douce offers charming rooms decorated in period style. The dining room serves delicious regional cuisine: the specialty dish is Atlantic salmon, king of the rivers of Matapédia. A few blocks away, the Linden Tree B&B offers 5 rooms in a house built between 1917 and 1920. Each room has a name and a distinctive personality: Juliet, Anne, Donalda, Iseult and Esmeralda. The only thing they have in common is that they are all cosy and come with goose down comforters and comfy bathrobes. You’re also in for a real treat at the crepe restaurant! In Gaspé, the William Wakeham House, built in 1860, will charm you with its distinctive cut-stone structure, unique in Gaspésie, and its warm hospitality. Head out to the terrace to admire the stunning view of Gaspé Bay and the York River and enjoy market cuisine in the dining room. If you have a sweet tooth, you won’t want to miss their homemade desserts and ice cream. Located in the heart of Tadoussac, La Galouïne Inn and Restaurant is within walking distance of all the attractions in the village. This establishment offers cosy rooms as well as regional cuisine—enjoy bistro fare on the patio accompanied by draft beer. You can also purchase homemade delicacies from their market—you will undoubtedly want to take some of these goodies home with you! Only 15 minutes from Tadoussac in Les Bergeronnes, the seaside Auberge La Rosepierre immerses you in a romantic atmosphere with its pink granite exterior and its soft and inviting decor. The entrance hall is decorated with works of art that represent the region. In the dining room, Chef Diane offers you refined dishes made from her own secret recipes! On Havre Aubert Island, next to the La Grave historic site, you will see a sunny yellow house: Auberge chez Denis à François. Offering a rustic yet romantic decor, friendly atmosphere and authentic cuisine, this inn will charm you. Want to try pot-en-pot, a typical Island pot pie? Or why not be adventurous and try seal meat? A little further on the same island, on the L’Anse-à-la-Cabane side, Havre-sur-Mer, Sympathetic Inn welcomes you in a haven on peace on the beach. Here you can enjoy a magnificent view of the sea and the fishing harbour as well as treat yourself to a day at the spa. And in the morning, you’ll be served a three-course breakfast! On Havre aux Maisons Island, you can stay at Domaine du Vieux Couvent, a former convent built between 1914 and 1918. This lovely historical building offers quiet, newly renovated rooms; bistro-style cuisine featuring seafood, local meat and Island cheeses; as well as privately imported wines. In a completely different style, La Butte Ronde Couette et Café is just as charming. In addition to a lounge, veranda and patio, this school-house-turned-B&B offers spacious rooms with luxurious touches: bathrobes, aromatherapy and more. While you’re here, why not treat yourself to an Esalen massage. You deserve it—you’re on vacation! If you’re looking for a different type of lodging, there are two hostels in Gaspé: the Douglastown Hostel and the Forillon International Youth Hostel. Both provide a communal kitchen, laundromat and Internet access (three computers at the Douglastown Hostel and WiFi at the Forillon International Youth Hostel). Located along Gaspé Bay near Forillon National Park, both hostels will appeal to outdoor enthusiasts, especially birdwatchers. Born in Bas-Saint-Laurent, Anne-Josée Pineau loves this region and is delighted to introduce others to it. Never far from the sea, she’s fascinated by lighthouses and could live on seafood alone! On this blog, she likes to write about our regions’ unusual attractions, make your mouth water by describing local delicacies, and pique your interest by revealing some of the hidden beauty found in Québec by the Sea. In other words, she wants to provide you with lots of ideas for an unforgettable vacation!